It’s not widespread yet, but there are small flu outbreaks all across the country. As flu continues to ramp up this month (especially with increasing holiday travel), make sure you’re prepared. In addition to frequent hand washing, support your immune system with colloidal silver. Coughing, sneezing, aches, fever, and a quick onset of symptoms indicates the flu. 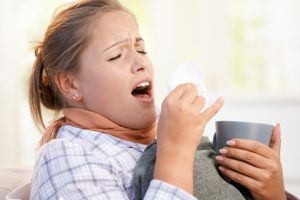 Although some people will say “the flu” and mean stomach illness like vomiting and diarrhea, inFLUenza is a respiratory illness… and it can knock out even the healthiest adult for a week or more. The flu shot offers some protection, but unreliably. Last year it was only about 37% effective—and vaccine efficacy is weighted by the health of the person receiving it. Healthy twenty somethings who get a shot on a good day have the best chance of getting some immunity, while people with chronic health conditions, a little more age under their belt, or who are having an off day (maybe they were sick recently, didn’t sleep well the night before, or are coming down with something) are less likely to have a shot take hold. During dry winter months, the flu virus (as well as other viruses like Norovirus which causes stomach flu) spreads. You can help slow the spread of the flu by running a humidifier. As more people catch the flu, coughing and sneezing help fill rooms with flu particles, spreading the illness. While frequent hand washing can dramatically help reduce your risk of catching the flu, no one can avoid it completely! You can take colloidal silver as a daily immune supporting supplement. You can also get more from colloidal silver by using in your neti pot, doing a more involved sinus flood, or using it in a nebulizer. Don’t wait until the flu is more widespread. Be prepared with immune supporting colloidal silver right now.